Blood clots, cancer, and damaged brain cells — these are the last words anyone wants to hear at the doctor’s office. They’re also the stuff that scientists are hoping to be able to fight one day with nanotechnology. A new study released in the journal Nature Communications details just how scientists are hoping to transform modern medicine with very tiny robots. 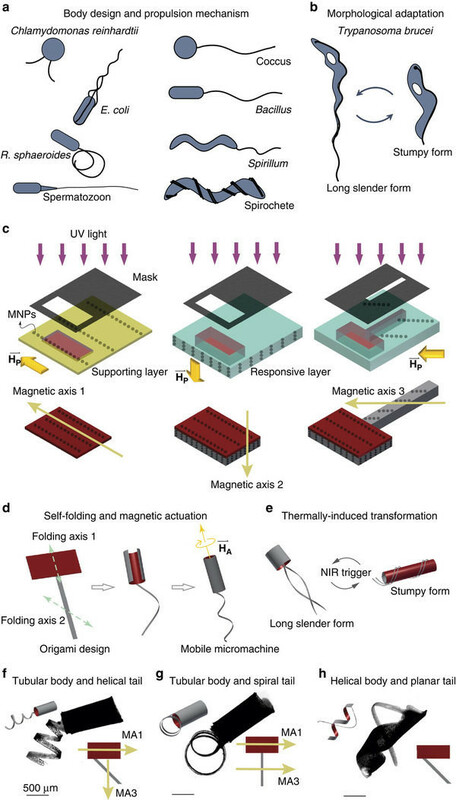 Selman Sakar from EPFL and Hen-Wei Huang from ETHZ have worked together to create prototypes of nanosized robots that could actually enter human bodies. While they haven't yet tested these little robots in people, they hope to do so soon. Perhaps, in the not too distant future, the nanosized robots might do things that are too microscopic for doctors to currently perform and are too sensitive for common drug therapies to handle. The scientists modeled their robots on creatures in nature — the bacteria African trypanosomes . This is the bacteria that causes African sleeping sickness , a disease in which infected people become confused, experience changes in behavior, lose their regular sleeping pattern, and sometimes even die. The reason that these particular bacteria are the perfect models is because they have the unique ability to control their flagellum, the tail-like part of their bodies that helps them control their movement around the human body. Once the bacteria have reached their target in the human body and propulsion is no longer needed, they (and likewise the new robots) can wrap the flagellum around their own bodies for protection. Doctors think they will be able to direct the robots in the body using an electromagnetic field. The robots also have the capability to change shapes in different heat. This could make them very adaptable when it comes to treating different diseases. The National Nanotechnology Initiative defines nanotech as any science, engineering, or technology that is 1 to 100 nanometers in length. To put that into perspective, a sheet of newspaper is around 100,000 nanometers thick, so clearly these little nanotech prototypes are miniscule. Scientists have only had microscopes capable of seeing nanoparticles for about 30 years, but research has and is growing in nanotechnology at an exponential rate since then. With this kind of progress, we might well be getting help from some very little friends to help us treat some of our worst diseases in the near future.